Number need to be closer to power of 10. (10, 100, 1000, etc). Lets see examples for how to find Cube of a Number using Yavadunam in Vedic Mathematics. if we wanna find cube of 449 then can we use working base method????? as we use in squares???????????? 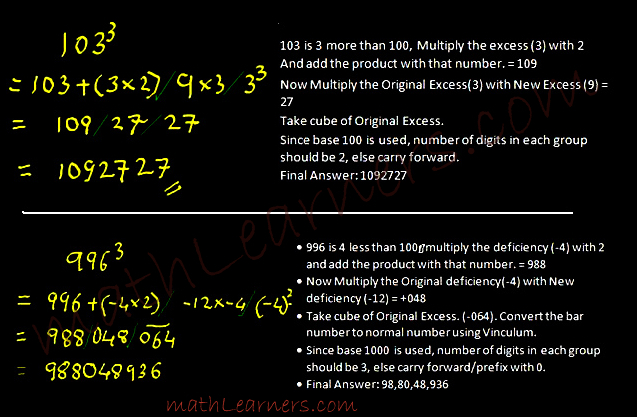 In 2nd eg., while converting the vincullum number into normal, the digit 8 should be decreased. My Bad … Thanks Pratik for correcting it. Hi Aditya, If you are saying ‘should be multiplied with 3 and not 2’ for 1st line of 1st example…then its wrong. We need to multiply excess or deficient with 2.